Pecan Pie Cheesecake? Have you ever had two utmost favorite desserts and, to your delight, found them together? Well, my dream came true when I discovered this marriage between pecan pie (which I love!) and my other favorite, cheesecake! It doesn’t get any better than this. Wow! Place pie crust in the pie pan. Using a medium sized mixing bowl, combine 1 egg, cream cheese, ½ cup sugar, 1 tsp. Vanilla and ¼ tsp. salt. Beat them together with electric mixer till smooth. Pour the cream cheese mixture into the pie crust lined pan. Cover the top of the cream cheese mixture with the chopped pecans. In another mixing bowl, whisk together 1 cup light corn syrup, 3 eggs, ¼ cup sugar and 1 tsp. vanilla extract. Pour onto the pie and place the pie on a baking sheet. Before serving, cool on a cooling rack for at least an hour or refrigerate it for later. *Adapted from the Pillsbury recipe. So what are YOUR favorite dessert recipes? I just love throwing dinner parties for family and friends. Each time, the first thing I decide is what we will serve for dessert. My easy peach pie recipe made with frozen peaches. For some variety, I made a pretty lattice work pie crust top and added a dough cutout – a peach with leaves. 1. Flute the edges of the bottom pie crust. 2. Pour the prepared filling into it. 3. Cut the top crust into strips. 4. Lay the strips across the top, leaving 1 – 2 inches open in between. 5. Weave the remaining strips through the first ones, going the opposite direction, like weaving a basket. 6. Fold the edges under and pinch them, fluting them along with the bottom crust. 7. Peach Cut-out: use a small glass to cut out a circle for the peach. Using a knife, cut two or three leaf-shaped pieces of dough. Place the leaves on an edge of the pie and lay the circle of the leaves onto the part where the leaves meet. Press lightly. 8. Baking Tip: cover the edges of the pie with aluminum foil prior to baking to keep them from burning. 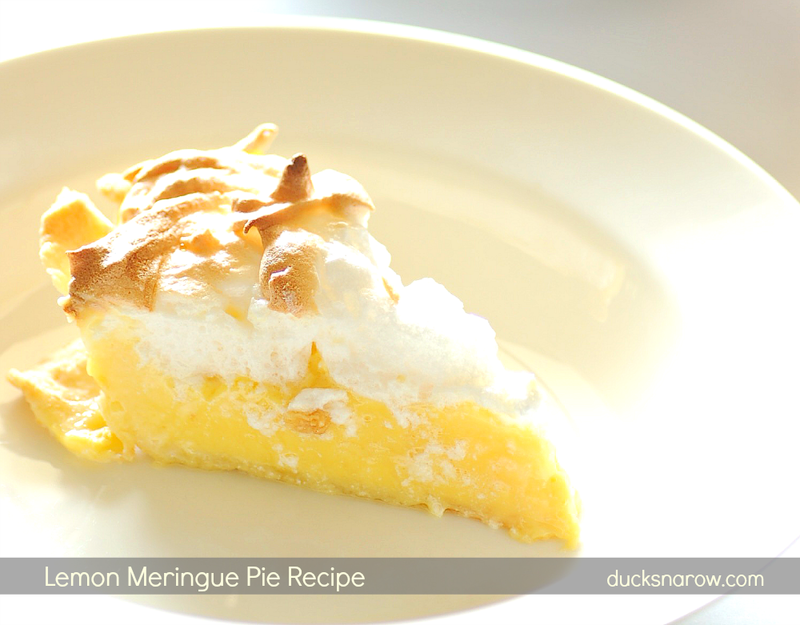 Lemon meringue pie has always been a family favorite – a special dessert that we often had on holidays. We loved it, yet, I never had the courage to try making one myself. I’d heard that meringue was difficult to make. Convinced that was true, I never even made the attempt. Last fall, I took a pie baking class from my neighbor. Lorane is an amazing baker. So good, in fact, that she is affectionately called “The Pie Lady.” She taught us how to make a Dutch Apple Pie and a Lemon Meringue Pie. My expectations were that the apple pie I’d make would be great but the lemon pie, not so much. Boy, was I wrong! The lemon pie turned out so perfect that it didn’t make it past the night. My husband and I ate the whole thing. No joke! The apple pie was well set but the lemon pie was not cooled yet so it slide around a bit. See the edges (above?) Looks a little sloppy? You’d think I’d baked it on a ship! But, oh, did it taste great. Cook sugar, water and cornstarch in a saucepan on medium heat. Stir gradually until mixture thickens and boils. Remove from heat and pour 1/2 of the mixture into the bowl of pre-beaten egg yolks. Add that back into the saucepan with the rest of the mixture, blend and boil 1 more minute. Add butter, lemon juice and lemon rind. 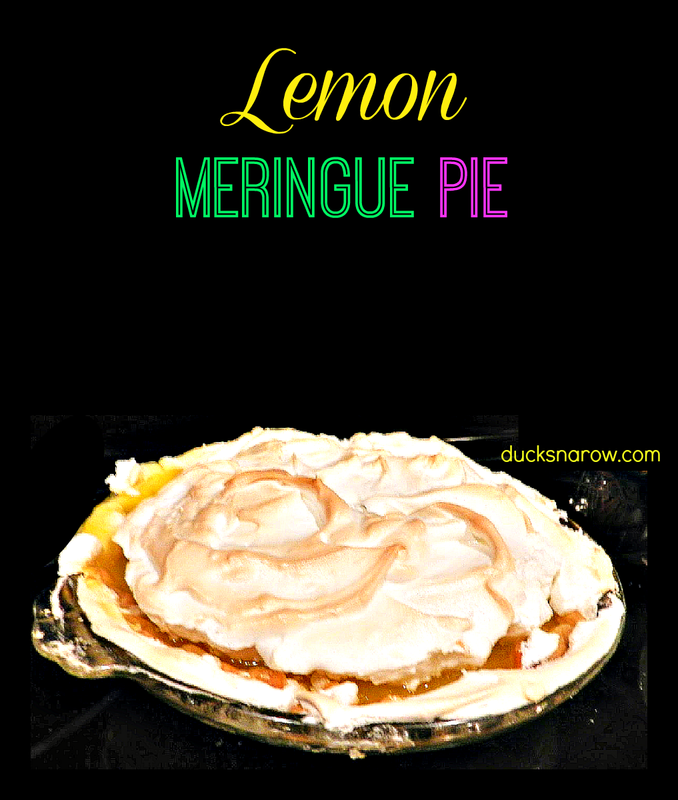 Pour mixture into your baked pie shell and cover with meringue. Beat eggs and cream of tartar until frothy. Gradually Beat in sugar, a little bit at a time, continue beating until stiff and glossy. Pile meringue on filling, seal edges and swirl. Bake until golden brown, don’t overbake. Cool gradually, keeping your pie away from drafts. Best baker and teacher ever. When I entertain family and friends I love to make desserts from scratch. This year I have been in the mood to make a yummy peach pie. First, made a sour cream peach pie. It tasted great but I wasn’t able to show you a picture of the final product because the filling ran. It wasn’t pretty enough. Our family definitely loved it – this I know, because there wasn’t even a morsel left. Someone must have licked the bottom of the pan when I wasn’t looking–that’s how good it was. I also made a delicious peach cobbler that was so easy we are sure to have it again real soon! 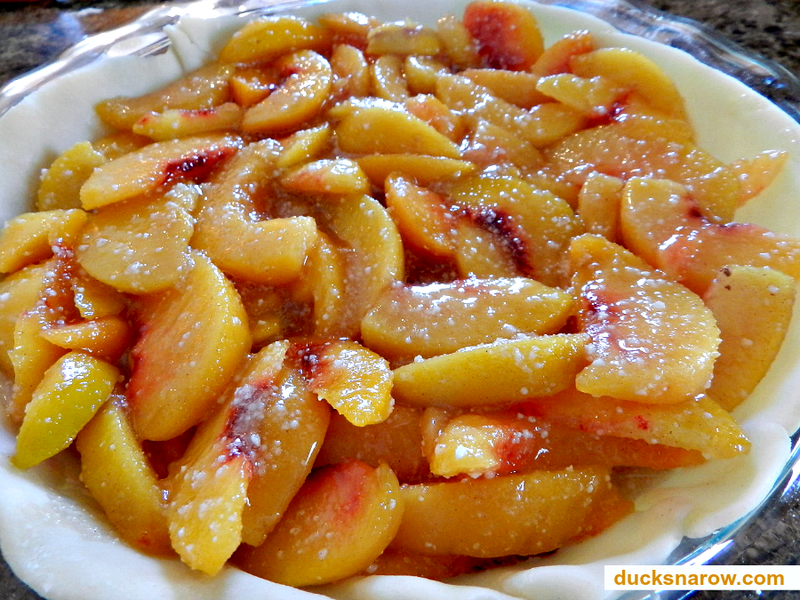 In searching cookbooks for a different peach pie recipe, I found this easy delicious peach pie recipe with frozen peaches. 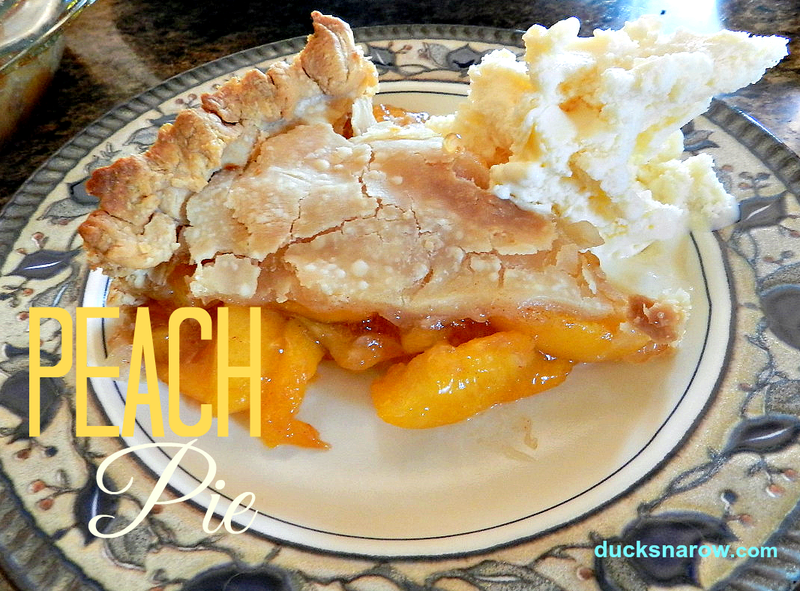 This is by far the best peach pie I have ever eaten and it is so easy to make. When you taste it, you will see what I mean. It tastes as if the peaches were just picked off the tree. A frozen peach recipe that tastes like fresh? A dessert lover’s dream come true! So fastened on my apron and gave it another crack. This time I made a classic peach pie with tapioca, in hopes that I would get a great tasting, great LOOKING peach pie to photograph…and it worked! This pie tastes wonderful and it looks pretty, too! I started with the basic Pillsbury® recipe in my Pillsbury® cookbook with frozen peaches and made a couple of little tweaks. Thaw peaches (partially) according to package directions. Combine peaches, sugar, tapioca, cornstarch, cinnamon and lemon juice* in a large mixing bowl. Let it sit for at least 15 minutes, gently stirring once in a while. 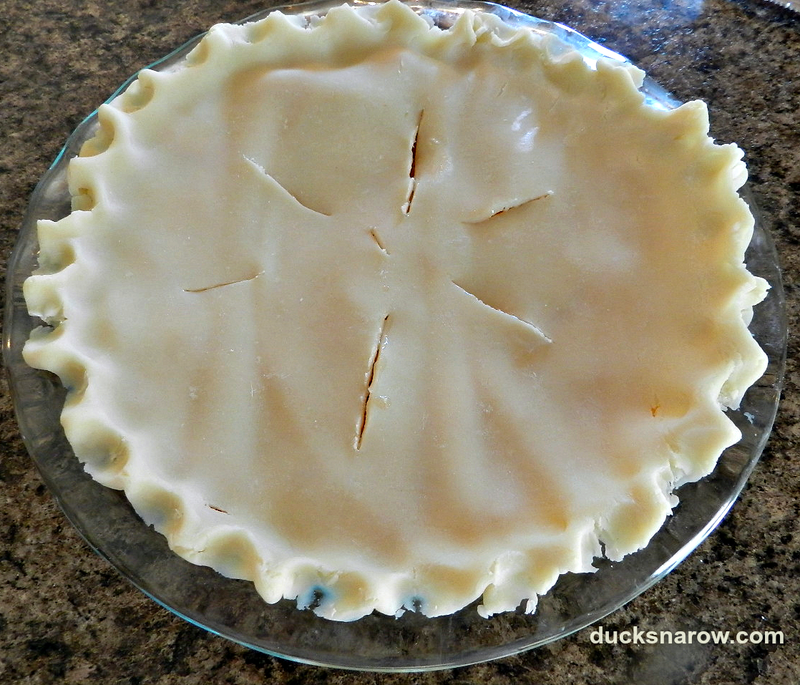 Unroll the first pie crust on a clean flat surface. Dust both sides lightly with flour; place in ungreased 9-inch glass pie plate/pan, pressing it into place. Spoon peach mixture into the crust-lined plate. Press filling gently against sides and bottom. Place the second crust on top and flute the edges. Vent by cutting slits in several places. Cover crust edge with strips of foil to prevent it from burning. Bake 20 to 30 minutes more or until golden brown. Cool at least 2 hours. Tip about the lemon juice*: the peaches seemed tart enough to me so I left the lemon juice out. (Plus many of the comments online supported that decision.) The pie tasted absolutely great without but, next time, I will include the lemon juice. It will be even MORE delicious with that little extra zing. You can use a complete pie crust for the top of this pie, or a lattice work crust. On special occasions when pie is served in my home, Sarah Lee is the caterer. Her pies are so perfect, why bother with scratch? She does a superb job. This year I had a little more time on my hands, though, so I daringly ventured where I had never gone before and made a homemade Peach Pie. Peaches and Sour Cream to be exact. Needless to say, it was the one pie with no leftovers at the end of the night. Sarah’s cherry and pumpkin pies were well eaten with some left. Our neighbor sent a delicious dutch apple pie that diminished in size as well. But only the peach pie was GONE! I suppose it was because it was different, not that Sarah Lee had dropped the ball. This peach pie tasted really really good. Before I share the recipe, let me confess that I did not make the crust from scratch. I used an All-Ready Pie Crust. That is as close to homemade as you’re going to get. What I never had successfully achieved was how to flute the edges of a pie crust. It never looked right. Ingredients and my freshly fluted pie crust! Yes! I did it myself, after watching this short video to learn how! Angie from Over The Kitchen Counter shows us how to flute a pie crust! Recipe originally posted on All-Recipes but adjusted a bit by me. Blend together sour cream, white sugar, 1/3 cup flour and almond (or vanilla) extract until smooth. Dust the pie crust with 1 tablespoon of flour. It protects the pie crust from becoming mushy from the peaches. Alternate layers of peaches and the sour cream mixture. Start with a layer of peaches and finish with a layer of sour cream. Bake in a preheated oven at 425° for 20 minutes. Reduce the heat to 350°. Bake for an additional 35 minutes at that lower heat. Remove the pie from the oven and sprinkle brown sugar on top. Put the pie back in the oven on BROIL for 1 minute or until caramelized. Combine sour cream, flour, sugar and extract. Top with sour cream topping. Add a second layer of peaches and complete with sour cream topping. Sprinkle baked pie with brown sugar and briefly heat on broil. Now, this pie was so popular that I was unable to get a photo of a slice on a plate. Soon as I would dish one up, it would vanish! Empty plate. When I make my next peach pie, I will update my post with a visual. Needless to say, it looks great and tastes AMAZING!